Can you guess why I haven't been around lately? If you guessed it was because our precious baby boy was born on November 6th you are right! Showing off his pretty brown eyes. 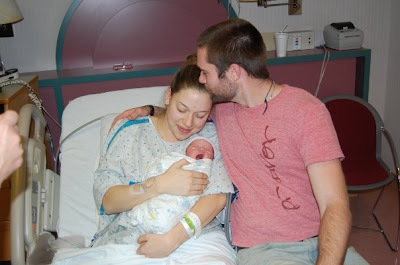 Jack Quinlan was born at 8:37 pm, after only 12 hours of labor. He weighed in at 7lbs 1oz. and is 19 inches long...cutest little peanut I have ever seen! 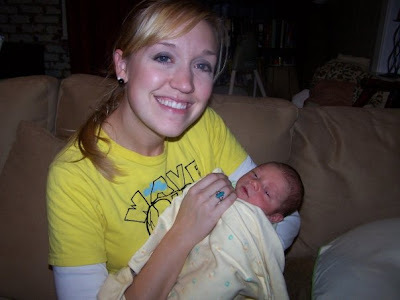 My water broke early on Friday morning, and by Friday evening my son was in my arms. My life was changed so completely in that moment, and I will forever be grateful for this precious gift of God. Wide awake with Aunt Emily. Bear with me as we get settled into a routine here at home, I can't wait to introduce you all to him a little bit more through this website. Thank you for your advice, your sweet thoughts and words, your well-wishes and above all, your prayers. From being a couple, to a family...in the blink of an eye. I thought that might be where you were! I am so excited for you! Congratulations! Now we both will have our Jacks! And you're not going to believe this but we are doing our Jack's nursery in Dr. Suess too. He is SO cute! Congrats again! Congratulations! He is so handsome! Congrats! I can't wait to see more pictures of the handsome little dude! I wondered if there might have been a baby last weekend! Jack is so gorgeous! What a gift! Congratulations! Hope you're feeling well and getting a little rest in so you can so fully enjoy these first few weeks together! I was hoping for news! Congratulations; he's adorable! Oh I am SO happy for you guys!! This post brought tears to my eyes, so sweet. :-) And Jack is ADORABLE! What a peanut. Can't wait to see more pics and hear more about him! He is gorgeous, and beautiful. Yes, I figured you were busy! He's perfect! And I love the strong simple name. All the best to you and your family!! I cannot wait to meet him! yay for the Weyrauchs! Congratulations! I am so happy for the two of you. Congrats Mouse Family! Jack is precious! What a cute little mouse you've added to your nest! The boys have it! coodos to all the boy guesses in your survey! I give you all my best! Congratulations :)! Oh He is beautiful! Thank you for sharing your precious baby boy. You were in my heart and prayers these last few days, I knew it was coming quick. ((hugs)) Congratulations my new mommy friend! Congratulations, I know he is perfect! Oh - such wonderful wonderful news! Congrats on the new family. I can't believe I missed this.....hides head in shame in the corner..........CONGRATULATIONS!!!!! !HE is beautiful!!!!!! !